Just finished up with this pipe. I had a lot of fun with this one! 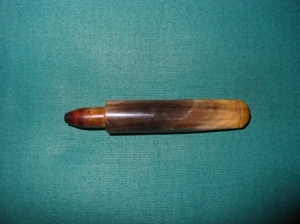 It is an old horn shaped pipe. It is stamped The Regent and has a sterling silver band on it. The hallmarks are the reclined lion (sterling silver) the Anchor (Birmingham) and a mystery stamp – a five point star (no date sign like that on the British sterling sites). I was reading in Gary Schrier’s Calabash book this evening and came across a calabash with the same hallmarks. He said it was a Faux Birmingham made pipe. The calabash he had was a Manhatten made in New York City. The question is do I also have a Faux Birmingham pipe?? It was dirty and I reamed and cleaned the bowl and shank. It had a thick cake and a bit of cob webs in the bowl and shank. It also did not have a stem. It came to me as a bowl without a stem. I had an old horn stem in my can of scavenged pipe parts that was that right shape and whose tenon fit perfectly. It was about a 1/4 to large in diameter. I used my dremel to bring it close to a fit and then sanded it until it was a perfect fit. 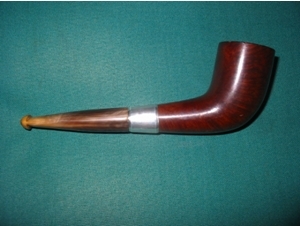 While I worked on it I removed the silver band in order to get the stem fit to be flush with the briar. When I was finished with the fit I polished the horn stem until it glowed with 400 and 600 girt wet dry sand paper, micromesh pads up to 4000 grit and then Tripoli and white diamond. 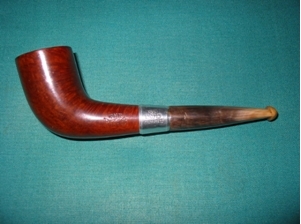 Then I reset the band with a bit of superglue and then put on the stem and gave the silver a polish and the pipe a buff. I have included a pic of the stem first to show you the look of the beautiful old horn stem. It has an orific button (single round hole in the button). It seemed to match the age of the pipe in terms of look. The rest of the pics are of the finished pipe. Thanks for looking. 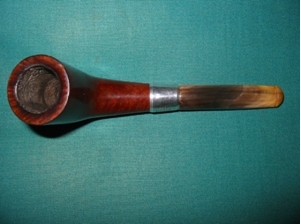 This entry was posted in Examples of Refurbished Pipes and tagged fitting a horn stem to a shank, Horn stems, orific buttons, pipe restemming using horn stems, sanding horn stems, shaping horn stems, stem work, The Regent Pipe, turning horn tenons on June 9, 2012 by rebornpipes.